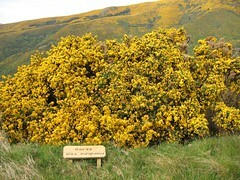 Gorse (Ulex europaeus) is a prickly shrub that is the number one weed in New Zealand. Due to the favourable climate in New Zealand, in a short time gorse was producing a lot of seeds to store in the seed banks. To combat this problem, the gorse seed weevil (Exapion ulicis) was introduced into New Zealand in the 1930s. However, due to the favourable climate in New Zealand gorse was having two reproductive periods per year and the gorse seed weevil was only active during spring. Recent Lincoln University Masters student, Craig Sixtus, who has been fascinated by this particular weed for a long period, as part of his study for his Masters degree, he studied the viability of gorse seed that had been attacked by the gorse seed weevil. In this study he found that the gorse seed still had a high percentage of viable seed even though the gorse seed weevil had been having a picnic. He tested the viability of gorse seed that had had some of it eaten by the gorse seed weevil (New Zealand Plant Protection Volume 2003). To combat this, the gorse pod moth (Cydia succedana) was introduced into New Zealand in the early 1990s. This moth has two reproductions per year, to coincide with the reproduction of the gorse. Craig had trials throughout the South Island, New Zealand, from Golden Bay to Mackenzie Basin. He studied the effectiveness of both of the seed eaters. The Golden Bay sites had active gorse pod moth for most of the year, whereas the sites further south only had a short period when they were active. The gorse seed weevil was more active at southern sites. The highest percentage (45%) of pods damaged by gorse pod moth was at East Takaka, Golden Bay. Lake Ohau, Mackenzie Basin had a short period where gorse was reproducing, mature pods being produced during December with a few left to open in January. The gorse seed weevil was most active here, damaging 76% of pods. At the southern sites there was a shorter period when the monthly average maximum temperature was above 10ºC, therefore there was less insect activity. However, there were still ample pods available. These results were published in the Plant Protection Quarterly Volume 21. The gorse pod moth larvae eat all of the seed in a pod before they enter another. Previous studies have found that the larvae will enter 2-3 pods before they pupate. Craig found that the pods in Golden Bay had more seeds per pod than the pods from further south (8 v 4.5). It is assumed that as the Golden Bay pods have more seeds, the larvae would enter less pods. Now Craig is about to begin his study for his PhD where he will study the phenology of the gorse pod moth and the impact that it has on the seed production of gorse throughout New Zealand, including sites in the North Island. He will also see if this seed muncher feeds on other legumes when gorse seed isn’t available.